Artists of political satire in the early 1800s had fun on occasions with William Garrow, along with many others in the public eye. The British Museum is preserving over 10,000 of these satirical prints from this period…including a few with Garrow in the focus of the satire. In addition, Dorothy George, in her ‘Catalogue of Political and Personal Satires in the British Museum’,( IX, 1949) has given the political context to some of these prints. Drawing from these collections, and with some added words of my own, here are some of the satirical prints I find most interesting….ones that illustrate Garrow stories that I enjoy telling. 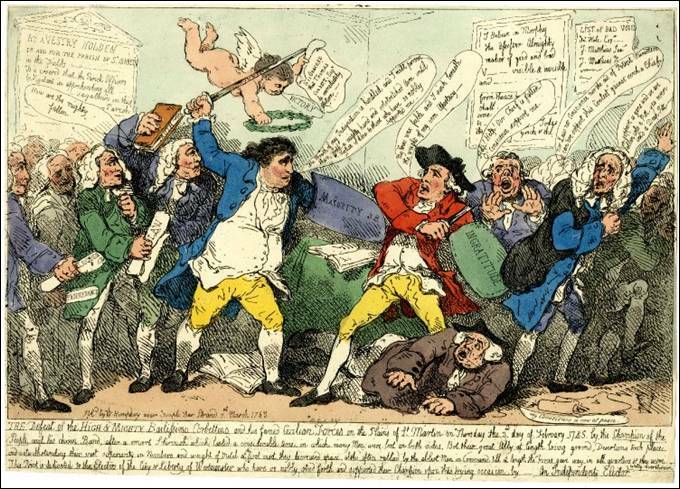 This scene depicts Charles James Fox winning the scrutiny, his challenge of the votes cast for him in the Westminster election of 1784-85 and obtaining his seat in Parliament. Garrow was one of the key lawyers representing Fox in this successful struggle and is depicted as one of the two lawyers immediately behind Fox. At this very early point in his career, Garrow’s skilled support of Fox was key in establishing his success in his legal practice. During this election and scrutiny, Garrow distinguished himself by great firmness, activity, and ingenuity. Not only did the legal manoeuvring apply pressure on Garrow, it put him to the test and he passed as he always did under rough and tumble pressure in the debating societies. And the opposition newspapers daily assailed him with abuse and ridicule, and in this situation, Garrow acquired new strength and flourished. During the election, the polling was both contentious and protracted, lasting forty days. The voters were subjected to every technique the contending parties could devise; intimidation, bribery and corruption. This election and scrutiny established Garrow in politics. It was his entry onto the political scene as a Whig, establishing his relationship with Fox, the leader of the Whigs, and put him into an association with the Prince of Wales who later became the Regent and then King George IV, a relationship that would have a significant impact on Garrow’s career. 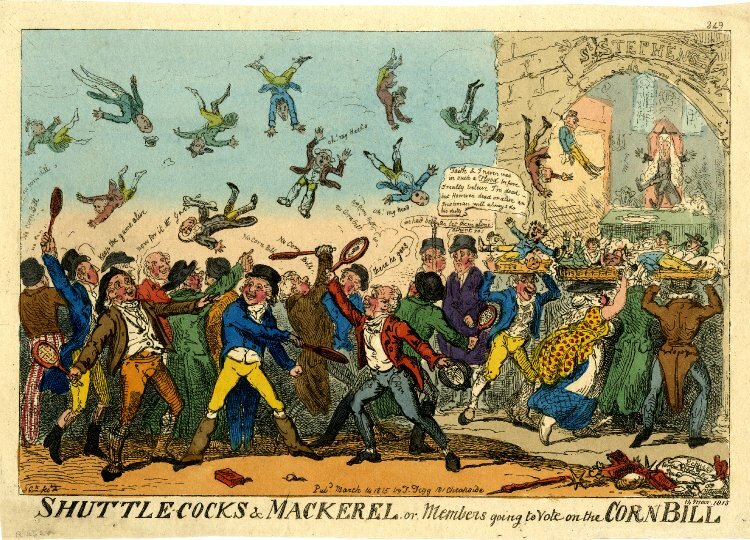 This is a satire of the riot of March 5, 1815 in which a mob surrounded the House of Parliament to show anger with the Corn Laws and to agitate against the Corn Bill. They seized members of Parliament trying to enter and demanded to know their names and how they intended to vote. Garrow had spoken in Parliament on this occasion, one of his colourful speeches vividly describing his experience in getting through the mob to enter the building so as to vote on the Bill. The members of parliament are represented as shuttlecocks being batted around by the crowd. Garrow, as Attorney General, is one of the shuttlecocks (a prominent one near the left side). One of the mob with patched clothes and the hat of a dustman or coal-heaver, shouts to his victim, a lawyer in wig and gown, “Now for it Mr Garrow.” The Corn Laws kept foreign grain from being imported, protecting the landed gentry from competition in the sale of their grain, inflating the price that the common people had to pay for food.